SANTA CLARA, CA--(Marketwired - Sep 24, 2013) - Document Capture Technologies (OTCBB: DCMT), the foremost leader in mobile scanning technology, and Accusoft, the leader in image processing SDKs, today announced a partnership to make accounts payable automation accessible to businesses of any size, from single-employee LLCs up. DCT's SimpleScan Connect web service can now route invoices directly to Accusoft's Prizm Capture invoice processing solution, offering significant efficiency improvements for SMBs. According to AIIM, the average business spends $11.60 per invoice in processing costs. By integrating with Prizm Capture, SimpleScan Connect brings advanced AP solutions to any business owner -- whether running a one-person LLC out of the owner's home or managing a retail store with a few dozen employees. Through Prizm Capture, QuickBooks Online and QuickBooks desktop users can enter bills into their accounts by uploading the invoice to Prizm Capture, verifying the data Prizm Capture has extracted from it, and clicking a button to post the data to QuickBooks, desktop or online. SimpleScan Connect acts as an on-ramp to Prizm Capture with desktop scanners, drag & drop desktop folders, or mobile apps that can all serve as inputs to the system. Accusoft has equipped Prizm Capture with advanced recognition technology that not only accurately extracts data from an invoice image, but also "learns" the more it's used. Because it's a cloud service, Prizm Capture requires no installation. To keep its customers' valuable data safe, Accusoft protects it in Prizm Capture with the highest level of SSL encryption available on the Internet. The SimpleScan Connect platform includes stylish hardware, mobile apps for iOS and Android, and web services that centralize and consolidate document management across multiple web applications. SimpleScan Connect makes it easy to digitize paperwork and integrate it into business processes and web-based workflows. Prizm Capture is one of many cloud services to which SimpleScan Connect can route documents for storage or processing. "SMBs are embracing cloud services even more enthusiastically than larger enterprises," said Karl Etzel, CMO, Document Capture Technologies. "SimpleScan Connect's seamless integration with Prizm Capture is exciting for us because it realizes all the document management and business process improvements that cloud services can offer when they are smartly integrated with capture solutions." SimpleScan Connect SP/DP Mobile Scanners are available for purchase in our web store http://shop.simplescan.com . Accusoft Prizm can be accessed via https://www.prizmcapture.com/ or from within the Intuit QuickBooks store http://appcenter.intuit.com/prizm. A 30-day risk free trial is available. Developed by Document Capture Technologies, Inc. (OTCBB: DCMT), (DCT), since 1998 the foremost provider of mobile scanning technology worldwide, SimpleScan Connect (www.simplescan.com) is defining a new category of personal and business data management tools. 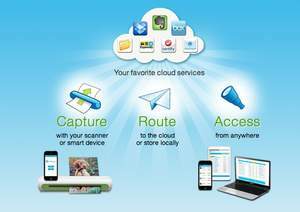 SimpleScan Connect hardware, web services, and mobile apps make it easy and efficient to digitize paperwork and store, organize, manage and share contacts, finances, documents, and media across popular cloud services. SimpleScan Connect is built on DCT's SimpleECM platform (www.simpleecm.com ), which enables OEMs, application developers, and systems integrators to provide cloud service connectivity, capture solutions, and workflow logic in their products and services. Accusoft provides a full spectrum of document, content and imaging solutions as fully supported, enterprise-grade, best-in-class client-server applications, mobile apps, online and cloud services, and software development kits (SDKs). Accusoft products work reliably behind the scenes for capturing, processing, storing and viewing images, documents and more. Add barcode, compression, DICOM, image processing, OCR/ICR, forms processing, PDF, scanning, video, and image viewing to your applications. For more information, please visit http://www.accusoft.com. The SimpleScan Connect logo and SimpleScan Connect Products are trademarks of Document Capture Technologies, Inc. All other products services, companies, and publications are trademarks or registered trademarks of their respective owners.